With the continued growth and development of the internet around the world, customer bases are becoming more international and the need to provide support in multiple languages grows. 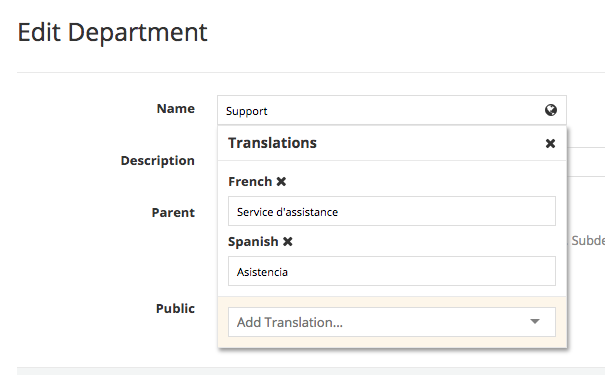 From version 2.2.0, SupportPal has complete multi-language support, allowing you to translate everything that you would need to run your help desk in more than one language flawlessly. Multilingual functionality is only available if you have more than one language enabled in your system. For information on on creating and enabling languages, please see the Languages documentation. Inputs that support multilingual content are marked by a globe icon, upon clicking the input field a modal will be displayed that enables you to translate the string into other enabled languages available on your system. To add a translation, pick a language from the 'Add Translation' dropdown. The language options available are determined based on your enabled languages. To delete a translation, simply click the X icon to the right of the language name. The X icon in the top right hand corner of the modal will close the modal window. To save the translations you must save the form by clicking the "Submit" button at the bottom of the page. A good example to demonstrate the power of multi-language support is the self-service area. Below outlines how to write an article in two languages. First, we fill out the fields for the default language of the system, which happens to be English. Next, below the article fields, there is an option to add a language. Here we select Spanish and a new set of fields will show. These should all be filled out in Spanish as shown. 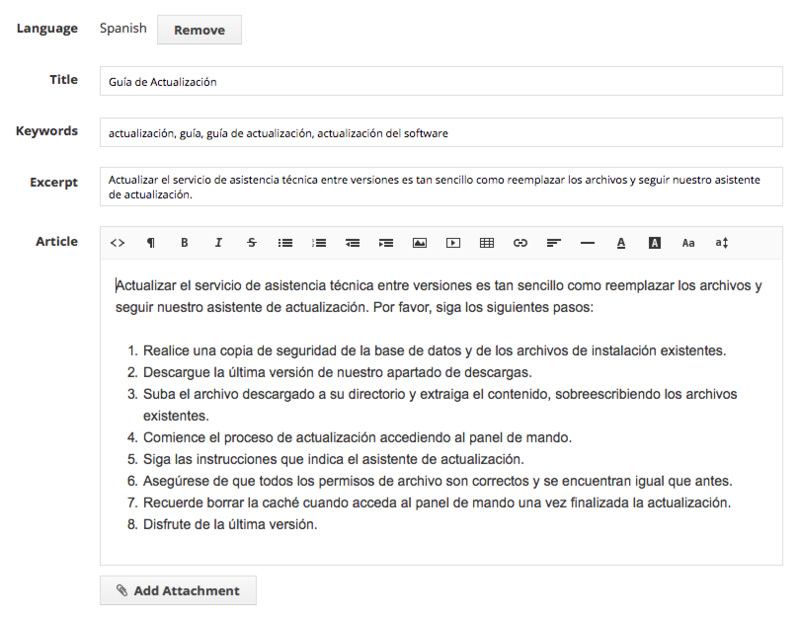 That's it, we hit save and can now access the article in both English and Spanish on the frontend. As you can see, everything has been translated, including the type name, tags and the article content itself. This also includes the keywords (for SEO) in the HTML source and the excerpt (not visible here). All the user has to do is select the correct language from the dropdown, set their language in their profile or access the correct URL directly and they'll see the article content in that language. All help desk URLs include the language of the user browsing, and all content on the page is shown in that language. This makes it easier for search engines to know what language the content on the page is and index it accordingly. 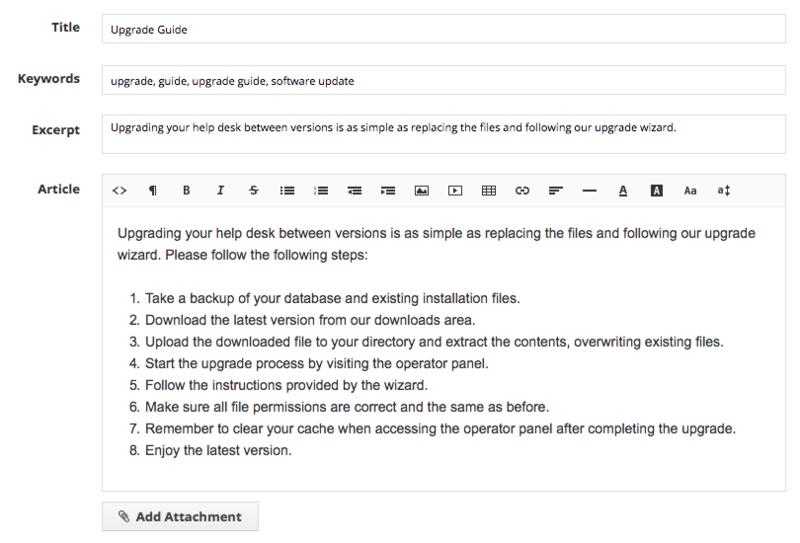 Please take care when editing / deleting translated content that affects the customer facing portion of the help desk. The URLs are dynamically generated so if you edit or delete a translated article title for example, then this may affect your SEO. Search engines may have also indexed your translated article page so users would be redirect to the SupportPal 404 error page if they attempt to visit a translation that no longer exists.